The team over at the Louisville Hackerspace LVL1 is not going to be outdone when it comes to collecting environmental data. They put together this Frankenstein of sensor boards that lets you collect a heap of data showing what is going on around it. At the center-left a small Arduino clone is responsible for collecting the data. Data storage is not talked about on their write-up, but if that’s an ATmega328 chip you should be able to work out an easy way to store data on the 1k of internal EEPROM. If that’s not enough, there is an I2C bus included on the board making it easy to add a compatible EEPROM. The sensor on the bottom left should look familiar. It’s a DHT11 temperature and humidity sensor we’ve seen popping up in projects lately. But wait, there’s also a TMP102 temperature sensor; but that’s not the end of it. A BMP085 pressure sensor also includes a third temperature sensing option. Want to see when the lights go on in the room? There’s a CdS sensor and a TSL230R Lux sensor for that. 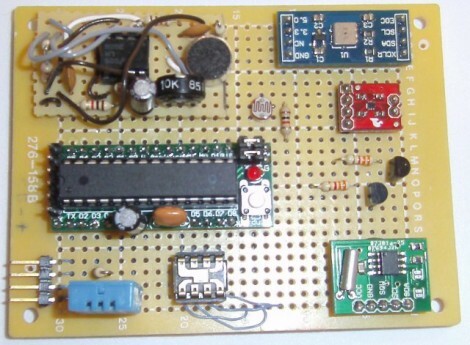 An op-amp circuit can measure the sound level in the room via one of the Arduino’s ADC pins. And finally, an RTC board is used for time stamping the data. Obviously this is overkill, and we’re sure it’s meant as a test platform for various sensors. All of them have been mounted on the protoboard and wired up using the point-to-point soldering method. Either what Longreacher said, or go ultrasound. I understand that is the way most “professional yet portable” equipment does it, what with the “no moving parts to fail” and all. Back at university, we used to play with an anenometer that consisted of a couple of wires. One of which had current flowing to keep it warm. When wind blew, it cooled the wire, and changed the resistance. From this we could figure out wind speed. It was pretty rough, but it gave passable results. This is actually the basis for the MAF (Mass Air Flow) sensor in cars today. First thing I thought of was put something this in a beer cooler space camera. It would be interesting to see what the temperature/humidity/air pressure was at the moment of balloon burst, or if the camera had a failure. I’m actually building more or less the same thing for a permanent setup. I’m using [Brohogan]’s excellent Arduino DIY Geiger Counter kit and have connected all kinds of additional sensors to it. CdS cell, SHT71 (temp/RH), BMP085 (Atm. pressure/temp) and of course the geiger counter, a hard beta/gamma and a alpha tube in parallel. Why a separate temperature sensor? The BMP085 already has a temperature sensor built in. It might be cool for other hackerspaces to have these as well and collect all the data together.